Ah, to teach high school! Crack that whip! Have you read Harry Wong's The First Days of School? It is my teacher's bible. Holy crap. I have done so well managing the classroom clowns doing what Harry Wong teaches! And conversely I had sucky semester not living the Gospel of Harry. I love your fashion pictures, I sympathize. I don't even try to go into the uncharted territories of posing in front of a camera in the middle of the street. LOL. Harry Wong is my. . . favorite. Tried to think of a more exuberant word, but it's the end of the day and. . . nope. Ha, high school! Seriously, so glad you love it! I'm an elementary school teacher through and through! 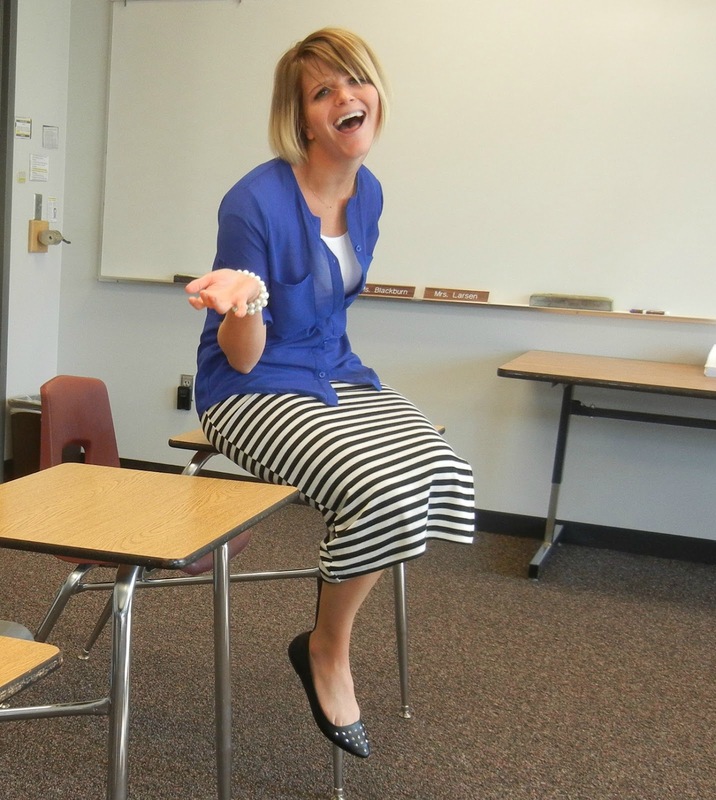 Your blog makes me want to become a high school English teacher more than anything, no joke! Which AP class are you teaching? My 11th grade AP class was English Language and I just remember it being extremely hard at first but ended up being one of my favorite classes in high school! I thought the sloths, and the alcoholic one was really funny! Yaaay! Teaching time is back! Good job on your first day, good luck on your second! Love it! In spite of their craziness, it seems like you have some good kids in your classes. Or just entertaining at least. I love juniors as well. At least in my experience they've been fun because I've known them for awhile so we've built a good relationship but they aren't on their way out yet. I do love seniors too because I LOVE hearing them dream about what they want to do with their lives and helping them prepare for college. But towards the end they can be obnoxious because a lot of them can be totally checked out and have the attitude of "I'm an adult now so you can't tell me what to do." Sigh. OMG I just know you are going to be so great at teaching AP! Looking back to my high school days, AP Lit was my favorite! And the reason why I ended up being an English major! I'm an attorney now, but I swear, I get a little jealous every time I read your posts about teaching English! Do'nt ya just love those ice breaker type of things? I used to hate doing them but then I love making others do them, haha! I love this, I always secretly wanted to take my english degree and teaching background and teach high school english. I love how much you love your job. Good luck this year! By the looks of the thinker pic - you will do great!!! Do it! It is never to late to start. I know this is weird advice coming from a stranger but it is the most rewarding job i have ever had! I'm sure Bonnie would agree! My year (with 8th graders) is off to a rocky start. They are SO talkative and immature. It usually takes until around late October before I feel really comfortable with them. My school does not allow cell phones in the classroom. Lockers only. Of course kids still sneak them into their pockets, but if caught with them out; the principal holds the phone for 10 days! Love your first day outfit! Hope the rest of the year is less crazy! This made me laugh so hard! I especially love the beginning classroom photoshoot. Also, cell phones in class?! Maybe I'm old school..or just old, you decide...but we couldn't even have them in class. Our teachers made us put them in a bin at the door. It was like airport security..but seriously, why are they allowed to have them!? Doesn't that defeat the purpose?! Sorry for all the ? !...it annoys me, too. Oh goodness, hopefully after a week or so they will all calm down. The cell phone thing will be a struggle though. I graduated 10 years ago, but when I was in school if you got caught with a cell phone it went to the principal's office and your parent had to come and pick it up. So did you make them say one interesting thing about themselves like in your faculty meeting? I want to hear more about your AP class! There's only 8 students in it? Have you ever tried the tactic of calling their mom or dad right in front of the class? I never did it, but I know of hs teachers that did when I taught in TN. That would always shut them up. You could say, "Hi Mrs. So and So. I have George here in class and he's having a bit of trouble in his first week of school. Would you like to talk to him?" And if they don't pick up just leave a message in front of the whole class. A totally calm message. I love reading your blog...you make me laugh! Just make a bin and call it the cell phone bin. I mean come on, just let them put their cell phones in the bin in the beginning of class and pick them up whenever they leave. If they leave it with you, you are more than welcome to pry. Just kidding. No not really..